"World's Best Large Ship Cruise Line"
Founded as a Roman city in the Middle Ages, Barcelona is a leading tourist , economic, and cultural center, influencing world commerce, education, entertainment, media, fashion, science, cuisine and the arts — contributing to its status as one of the world's major global cities. The soul of old Barcelona is its Gothic Quarter. Don't miss the Picasso Gallery, where adjoining 15th-century palaces house over 2,000 pieces of his work. Stroll along vibrant Las Ramblas, where street vendors and performers vie for your attention. Palma de Mallorca is the capital and largest city of the Balearic Islands in Spain. Its multicultural history is reflected in the wonderful variety of architecture visible throughout the city, such as its Gothic cathedral or the famous Castle constructed in 1300. In the heart of the city there is the old Arab quarter, with its maze of narrow streets hiding museums, palaces and exquisite courtyards. The excellent Museum of Contemporary Art is housed in the old fortress. The island also boasts of many beautiful beaches. Gateway to Mt. Etna, the awe-inspiring and still-active volcano, the seaport of Messina is the third-largest city in Sicily. Known for its fine cathedral, museums and rich Sicilian wines, Messina and the surrounding area was also the location for much of the Godfather films. An afternoon or a day in Messina can include a drive up to the windswept side of Mt. Etna (hold on to your hat—it is seriously windy here!) or to the shop-lined streets of Taormina. This island is one of Europe’s favorite playgrounds. It is the classic Greek Isle, with hundreds of whitewashed churches, thatched windmills catching the brisk breeze, and a busy harbor bobbing with fishing boats and luxury yachts. Visit neighboring Delos, which was the sacred isle and the religious center of the Aegean, with its impressive temples and ruins. Mykonos boasts of its incredible beaches, active nightlife, and great shopping. Piraeus is the main port of Athens, the biggest in Greece, and one of the most important in the Mediterranean Sea. No visit to Athens would be complete without a visit to the Acropolis. 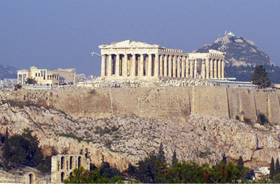 There you'll find the Parthenon, the largest building in the Acropolis and one of the world's most awe-inspiring sights. It was built as a temple to Athena and is still a remarkable structure today. Visit the Plaka, the old neighborhood of Athens and discover the narrow street and alleys, single-story houses, neoclassical villas, taverns and many tourist shops or explore the National Archaeological Museum, home to a formidable collection of the world's antiquities. This island is perhaps the most breathtaking of all the Greek Islands and its beauty is legendary. There is a magic energy here with whitewashed houses clinging to cliffs and hillsides set against the deep blue waters of the Aegean Sea. The excavations at Akrotiri have confirmed that human activity on the island continued until the eruption of the volcano around 1500 B.C. which entirely buried the island. All traces of humans vanished until the 13th century B.C. On the site of Akrotiri you’ll gain insight into life from 3,600 years ago when the town was under volcanic ash. Many experts believe Santorini was the home of the fabled lost continent of Atlantis. Rhodes, the largest of the Dodecanese (the name translates as "twelve islands"), draws more visitors than most other Greek islands. Its capital, Rhodes Town, offers an enduring blend of history and architecture, and the island's interior is filled with lushly forested hills. To the south, Lindos, one of the most stunning villages in all of Greece, is watched over by a picture-perfect ancient ruin on the hill above. Though many civilizations have left their mark on Rhodes, its independent spirit has endured and the island has retained its natural beauty, from the mountain heights to gorgeous beaches and coves. Valletta is the capital of Malta and a piece of living history with its fortified city walls overlooking the Mediterranean Sea and unsurpassed collection of original Baroque architecture. Valletta boasts many buildings from the 16th century built by the Knights of St. John. Amongst them is the majestic St. John’s Cathedral, the bastions surrounding the city, and several gardens. This smallest of European capital cities is a world heritage site. With plenty of cafes, wine bars, theaters, exhibitions and cultural events, Valletta is a vibrant city year round. There may be a few cabins still available on the ship, but there are no seats in the seminar. Currently our Waitlist is also full and we are not accepting any new waitlist reservations. All cruise and seminar reservations must be made through Life Journeys. Features sitting area, 32" LCD TV, and vanity. Features window, sitting area, 32" LCD TV, and vanity. Features floor-to-ceiling sliding glass doors, sitting area with sofa, mini-refrigerator, 32" LCD TV, and vanity. 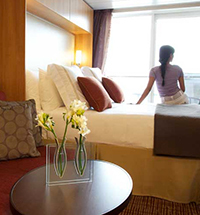 These staterooms have views that are partially obstructed by life boats or other ship structures. with sofa, mini-refrigerator, 32" LCD TV, and vanity. Features floor-to-ceiling sliding glass doors, sitting area with sofa, mini-refrigerator, 32” LCD TV, and vanity. The private balcony overlooks the ship’s stern. and vanity, with extra concierge amenities. Features floor to ceiling sliding glass doors, sitting area with sofa, mini-refrigerator, 32" LCD TV, and vanity. Includes priority seating in Blu Specialty Restaurant, unlimited access to Persian Garden and a personal Spa Concierge. Features floor-to-ceiling sliding glass doors, sitting area with sofa, mini-refrigerator, 32” LCD TV, and vanity. Includes priority seating in Blu Specialty Restaurant, unlimited access to Persian Garden and a personal Spa Concierge. with 52” LCD TV, walk-in closet, Bedroom with 40” LCD TV, shower/tub combination, and vanity. Butler Services. bath with whirlpool tub with separate shower stall, powder room, and vanity. Butler Services. in order to secure double occupancy pricing. Children rates are the same as 3rd and 4th passengers. Celebrity requires all group passengers pre-pay gratuities at final payment. Full suite (CS, RS) deposits are $1,800 per suite. Seats at the seminar are sold out. WAITLIST IS FULL. Ready to book your cruise? Register Now!